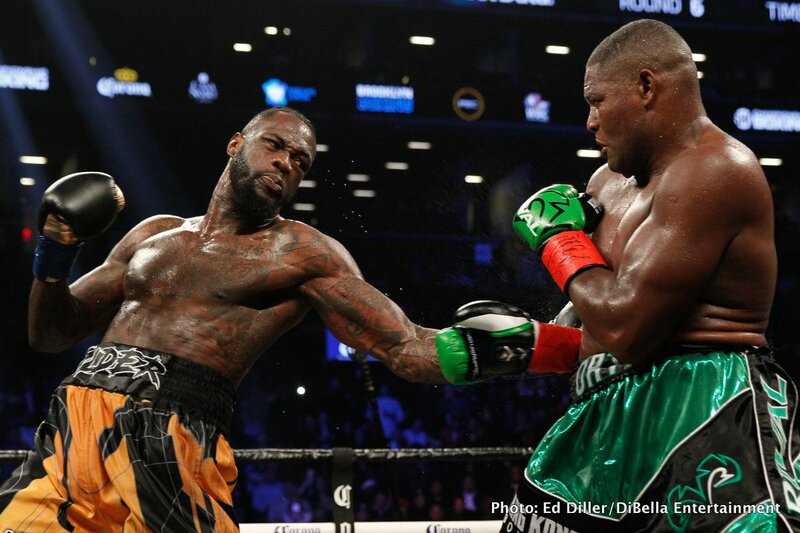 WBC heavyweight champ Deontay Wilder will be conspicuous by his absence tonight in Cardiff, Wales as rival heavyweight rulers Anthony Joshua and Joseph Parker go at it over a scheduled 12-rounds – or, to be more precise, Wilder will be conspicuous by his absence AFTER the fight. It was then that “The Bronze Bomber” was all set to enter the ring and go head-to-head, face-to-face, eye-to-eye with Joshua (providing he had beaten Parker of course) and tell him to his face that he wants to KO him. We know Wilder will not be in the house, or in the Motorpoint Arena, but he will be watching the US TV coverage of the fight on Showtime. Wilder confirmed this when speaking with Sky Sports earlier, and he also said that he, and the world’s fight fans, will be waiting to see whether or not AJ (again, if victorious) “mentions my name” after the fight. Wilder may be wrong about a few things (wrong to say, in an interview that has already received plenty of attention, that he “wants a body” on his record, and wrong to not come to Cardiff and receive a ton of media attention) but he is right when he says that a fight between he and Joshua is THE talking point of the current heavyweight division. Assuming he does beat Parker tonight, will AJ make it clear he wants to fight Wilder next? Will he indeed call for the fight we all want to see? There are other options out there for a victorious Joshua, far more than there are options out there for Wilder – such as a fight with Alexander Povetkin (assuming Povetkin gets past “desperate” David Price tonight), a US debut, maybe against Jarrell Miller, or even a return fight with Dillian Whyte (who may get to do what Wilder so badly wanted to do tonight, and get in the ring after tonight’s fight and get in Joshua’s face). Wilder says himself he “highly doubts” a fight between he and Joshua will happen next, and that he is simply hoping and hoping that Joshua calls his name out tonight in an effort to make the huge unification showdown a reality. We’ll soon see who Joshua wants next (again, providing he beats a very confident-looking Parker).